I love this! While perhaps the current square card reader for a business could be a bit more sturdy, as the free ones are a little on the flimsy side. Good for Starbucks for getting smart! 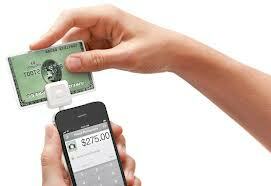 I’ve used square for craft fairs and such, and it’s so user friendly. Just setup your account, swipe and the next day, you have money! The hardest part as always, is finding people to give up the plastic! Congrats on FP. I’m all for guerrilla economics. Americans have bailed out the big banks twice in the past three decades, and we see no sign of reform at that level. The old “too big to fail” mentality continues to thrive, while simultaneously putting the squeeze on Main Street merchants. I’ve also seen the pitches for credit-card collection systems that arrive in our church mail and been appalled at the prices and the assumptions, as well as the percentage they want to skim off of nonprofit donations. In contrast, I’ve seen how the Square has been a great blessing at fundraisers for nonprofits, allowing for easy, quick transactions while allowing the needy organizations to optimize their income. That, too, is a local focus. Square Up has been a great product and service for me to use for my personal training business. Oops, you forgot your cash. NO problem. I have another way for you to pay. This is going to be huge for Square Up. I just hope they don’t start to get greedy and charge more in the coming years. Way to go Starbucks for looking at all the possibilities. Square Up must be working on a commercial grade swiper because that little square that I have probably wouldn’t hold up to the amount of swipes that Starbucks gets. Reblogged this on Khawaja Naveed Haider. I’m hoping this is a giant chink in the armor of the payment companies that have had a stranglehold on American businesses — and probably businesses abroad, too! It’s time we stop doing things just because “well, that’s the way it’s always been done”…and this is such a great step in the right direction. It makes me wonder what other disruptive technologies are on the horizon that we haven’t even considered yet. Cool suggestion for a technological resolution for an ridiculous charge for card transactions. That explains why some small businesses only accept cash. Excellent blog, I really enjoyed your insight. Keep up the good work. Please visit http://www.mynutritioninsight.com for information and disease prevention and healthy food and drink recipes. Add me on Twitter – Mona Lisa. this is fuckn cool!!! very very very smart. i worked at a family owned restaurant and honestly, the credit card machine was the worst. so expensive for something that was completely unreliable. plus, when it went down, which was often, we’d be left with irritated customers forced to run down the street to the bank. for some reason, these machines also seem to only actually work at large scale companies that can afford them no problem. it’s unfortunate. I love this, I love the people who have already been using it. When I made an unplanned stop at the farmer’s market, it was great to be able to use my debit card, instead of making a trip to the ATM and back again. I had never heard of this before but anyway to get coffee faster is always a plus. “There are a number of problems there – from somebody stealing your device to the problem of the drive-by download,” said Chris Hoofnagle, a lecturer at the University of California, Berkeley Law School. But again, everyone doesn’t participate for a reason. Both pieces, the blog and newstory mention the current issue of the processing fees. So… I’ll leave the continuation of further comment on my own in the event I blog my own on Starbucks on any matter. When I first head of Square and found out what it did, that uber-private place in the back of my brain screamed “BAD IDEA”! Not with a 10 foot pole. Faster coffee = happy me 🙂 Thanks for sharing! Great post, Nick. It’s an even more fascinating story when you consider Starbucks itself has the largest retail mobile payment platform.